If you believe everything told to you, we have some swampland in New Jersey to sell you. We always laugh over that joke, making fun of some of our ability to be deceived and willingness to believe even the most absurd statements. We can laugh because we all know that either we don’t actually own that bridge or swampland that we claim we’ll sell, or that the very item doesn’t even exist. Technically, though, there is swampland in New Jersey, and technically we do own it as it is part of the public lands. 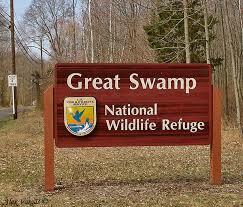 Say hello to the Great Swamp National Wildlife Refuge in Morris County, New Jersey. The refuge has such diversity in habitats that varied animals like fox, muskrat, deer, turtle, frog, bird and fish populate the area. The swampland is actually a leftover of the Glacial Lake Passaic, which was a 300-square-mile lake that covered northern New Jersey about 12,000-15,000 years ago. The lake came from melting ice off the Wisconsin Glacier and built up due to a plugged outlet, and the water finally released from the area at a higher altitude than the original outlet. The refuge contains part of the Great Swamp watershed that leads into the Passaic River. The wilderness has a variety of lands, from marshes to wet meadows to swamp woods to oak-covered ridges. The refuge is home to nearly 40 species of mammals, including the rare Indiana bat, which is on an endangered species list. There are also blue-spotted salamanders and rare bog turtles which call the refuge home as well. There are more than eight miles of trails in the refuge for ample hiking opportunities, but only during daylight hours. Camping and picnicking are reportedly prohibited anywhere in the wilderness area. The refuge was established after an outpouring of support in saving it from development of what would have been a major airport. Later, in 1968, the eastern part of the wilderness area became the first designated wilderness area to be under the auspices of the U.S. Department of the Interior. Yes, believe it or not, Florida does not have a monopoly on swampland. With the last Ice Age dropping glaciers as far south as the Atlantic seaboard, swamplands have been prevalent in certain areas of the country. New Jersey’s Great Swamp refuge is perhaps one of the better-maintained primitive lands that give us a view into what that part of the country may have looked like just after the big glacier melt. It is a piece of history. Or pre-history, if you would rather.